As more details emerged about today's bipartisan Senate budget deal, which will lift spending caps by $300 billion above the current limit and which prompted today's sharp Treasury selloff, it was revealed that the agreement would suspend the federal debt ceiling through March 1, 2019. ... prompted a revolt among GOP conservatives against the massive bipartisan deal, who complained that the GOP could no longer lay claim to being the party of fiscal responsibility. "I’m not only a 'no.' I’m a 'hell no,'" snapped Rep. Mo Brooks (R-Ala.), one of many members of the conservative Freedom Caucus who left a closed-door meeting of Republicans saying they would vote against the deal. According to The Hill, one of the Freedom Caucus leader, Rep. Dave Brat (R-Va.), called the budget "a Christmas tree on steroids." "This spending proposal is disgusting and reckless — the biggest spending increase since 2009," conservative Rep. Justin Amash Mich.) tweeted after the meeting. “I urge every American to speak out against this fiscal insanity." But the focal issue appears to be the debt hike, which is giving conservatives “heartburn,” said Rep. Dennis Ross (R-Fla.), a member of the GOP vote-counting team. The swift backlash from fiscal hawks means that Speaker Paul Ryan (R-Wis.) and his leadership team will need dozens of Democratic votes to help get the caps-and-funding deal through the lower chamber to avert a government shutdown set for midnight Friday. At the same time, some Republicans predicted a majority of the majority would back the package. Opinions were split on the chance of the budget's passage: Former Republican Study Committee (RSC) Chairman Rep. Bill Flores (R-Texas), who said he will probably support the agreement, estimated that about two-thirds of the lawmakers who spoke at the microphones during the closed-door meeting actually voiced support. Meanwhile, Rep. Mark Meadows (R-N.C.), the current Freedom Caucus chairman, predicted that the budget deal will get support from a majority of the majority, but not enough to pass without Democratic votes. It’s unclear how many Democrats will support the plan without concessions from Ryan, given immigration demands from House Minority Leader Nancy Pelosi who on Wednesday evening concluded an 8 hour filibuster on "dreamer" immigrants. BREAKING: House Minority Leader Nancy Pelosi ends 8-hour speech on 'dreamer' immigrants. At the same time, there are a lot of other items in the package that are attractive to Democrats, including money for opioids, disaster aid, more Children’s Health Insurance Program funding, community health center funding and the non-defense spending boost. Ironically, it’s also possible more Republicans will back the legislation given opposition from Pelosi. GOP Rep. Mark Walker, current RSC chairman, acknowledged in a tweet that the deal is “a struggle for any one with fiscal concerns,” but said he was more inclined to support it "the longer Nancy Pelosi bloviates on the House Floor." As described earlier, the deal between Senate leaders Mitch McConnell and Chuck Schumer calls for raising the debt ceiling through March 2019 and busting budget caps imposed by the 2011 Budget Control Act. It would boost funding for the Pentagon and domestic programs by about $300 billion over current levels over the next two fiscal years, but lawmakers said that only about $100 billion of that would be offset. The Bipartisan Budget Act also calls for an additional four years of funding for a popular children’s health program; $90 billion in additional disaster aid for hurricane-ravaged Florida, Puerto Rico and Texas; billions more to fight the opioid epidemic and funding for community health centers that serve the poor and uninsured. In short, a debt tsunami. Many fiscal hawks who were complaining the loudest Tuesday were among those lawmakers who rode an anti-spending, anti-debt Tea Party wave to Washington during the 2010 and 2012 cycles. Rep. Scott Perry (R-Pa.) described the atmosphere inside the GOP conference room as “tense,” while Rep. Louie Gohmert (R-Texas) said it was “kind of depressing” to think Republicans could be responsible for adding billions of dollars to the deficit when they control all the levers of power in Washington. “It’s too much money,” Perry said. Rep. Matt Gaetz (R-Fla.) quipped that fiscal hawks might now be an “endangered species.” Meadows and Reps. Jim Jordan (R-Ohio) and Warren Davidson (R-Ohio) were among the members who stood up during the conference meeting to vent their frustration, lawmakers in the room said. Retiring Banking Committee Chairman Jeb Hensarling (R-Texas), a close Ryan friend, also railed against lifting the debt ceiling, sources said. Jordan, a former Freedom Caucus chairman, said earlier in the day that he was disappointed by the tentative deal and expressed surprise that Ryan — who has staked his political career on being a fiscal hawk — would go along with the proposal. “I don’t know if we have enough votes amongst the members to stop this legislation,” the outspoken Alabama conservative said. “All I know is that unfortunately those who vote for this bill are betraying our country’s future and they are selling out our kids and our grandkids. Some defense hawks were also upset over the proposal because of the inclusion of the debt ceiling. Rep. Bradley Byrne (R-Ala.), a member of the House Armed Services Committee, said he was prepared to swallow the spending boost for domestic programs in exchange for the military bulk-up, but he was thrown off by raising the debt ceiling as part of the deal. Part of Ryan’s pitch to the conference, according to lawmakers who attended, was that the budget deal not only delivers a long-sought-after spending boost for the military, but it also clears the way for an honest debate over immigration if lawmakers don’t have the debt ceiling, the threat of government shutdown and other unresolved issues looming over their heads. Trump picked up on the defense angle in a tweet on Wednesday afternoon, saying that "the Budget Agreement today is so important for our great Military. It ends the dangerous sequester and gives Secretary Mattis what he needs to keep America Great. Republicans and Democrats must support our troops and support this Bill!" 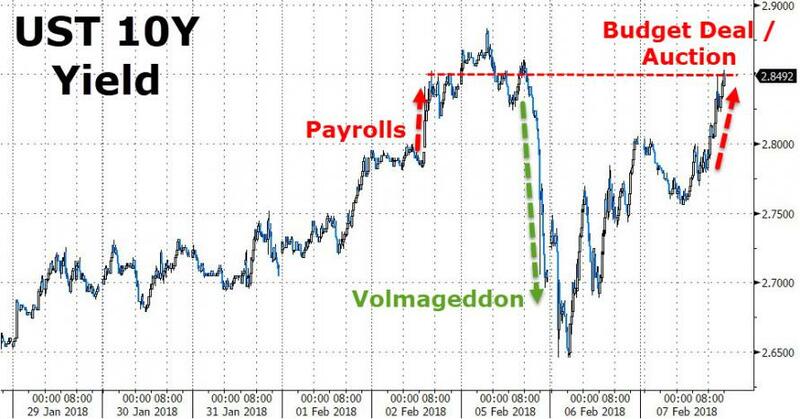 The irony here is that just on Wednesday morning, Trump was also complaining on Twitter that "good economic news" now make the market go down; what Trump was really complaining about was the rise in 10Y yield - an indicator of an overheating economy spurred in part by his fiscal reform, or excessive debt supply in a time when the Fed is also unwinding its balance sheet - which at or above 2.85% is now officially hurting stocks and other risk assets. 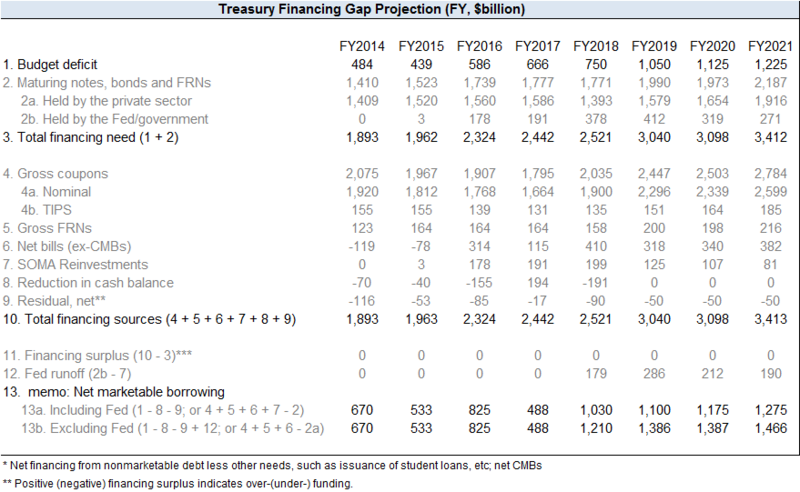 To be sure, the Budget agreement will achieve one thing - lead to a surge in US debt issuance, and - by implication - even higher yields, leading to an even steeper drop in the market, not to mention more frequent VIX-flaring episodes. Eventually Trump will have to choose: a budget deal including sharply higher yields and a slump in the stock market, or keep the equity party going and risk a government shutdown every few weeks. For now, he has picked the former, even if his earlier tweet indicates he doesn't fully understand it just yet.